I stumbled across this today on Pinterest, which is a great coincidence in light of today's Episode #0 of The Marvel Superheroes Podcast, which put me in a Mike Zeck mood today. 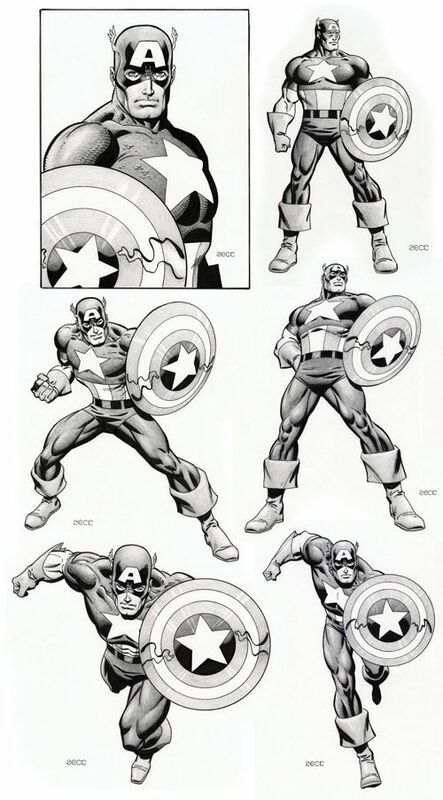 So here are some lovely Captain America sketches by Mike Zeck. Talk about polished. Not only are the figural lines as smooth as silk, but I think Zeck practices some sort of secret artist's magic when it comes to expressions and facial features. You know I love Zeck Cap the best, but it was a nice surprise to find a sideways promotion here, as well. Thanks! I wanted to use a color Zeck Cap commission I found for our banner, but the theme of alternate silvery/white costumes took over. You're welcome. Can't wait to see what else is coming on the podcast. Glad I picked now to start reading Marvel--I just happened to read DeMatteis's "Death of the Red Skull" a few days ago; Zeck's art is on the cover.